Hi @Subrahmanyam could you please explain how can i store and getting history to my DB using webservice . Hi @Subrahmanyam Please reply for above query. @rajinisiva93 Are you referring to the conversation history information? Conversation history can be accessed from a public API. Please follow the below link for more details. As of now for the conversation history API to work, you’ll need to enable botkit at your bot. Enable it at any of the events and the API should respond back to you with data based on the parameters passed. how to trigger that for each and every user from Kore.ai ? is there any other solution to this ? @aarsh.pandit Yes, it’s the same thought I had for now. Please give it a try. 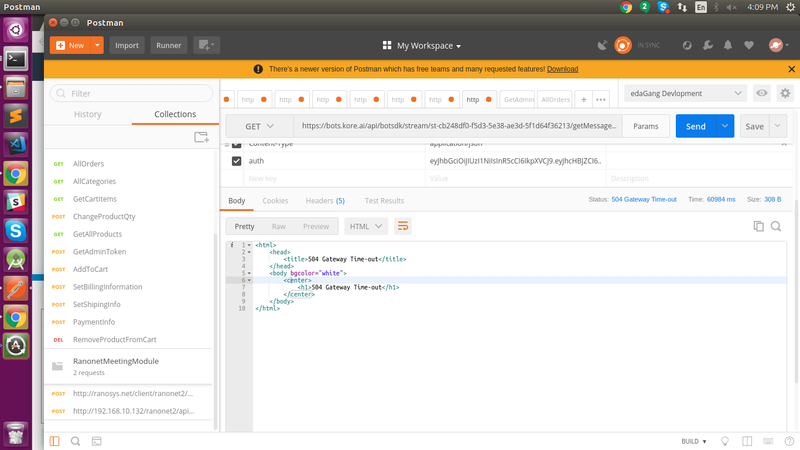 I m accessing Conversation History API using postman. Please help me providing solution for it. @vandana.agrawal we will validate the issue from our end and will get back to you. In the meanwhile, could you quickly check if botkit is enabled at you bot. (Agent transfer or any event at bot kit)? The API is dependent on the botkit as mentioned on the documentation. The app scope (Events and Extensions [in v6.3] > API Scopes - Create New if required) has to enabled of the conversation API.